In December 2012 terrorists planted a bomb on a bus and exploded it near the Cantt Railway station in Karachi, Pakistan. The blast killed six and injured about fifty people. It was a terrible event in the Muslim world’s largest city (over 20 million people) and a reminder that the most frequent targets of Muslim extremists are Muslims. Against this sad backdrop, Bilal Tanweer brings us The Scatter Here Is Too Great. This is a collection of interlinked short stories built around an unnamed narrator. He writes about his friends and family before and after that terrible day in Karachi. Tanweer does a fine job of painting Karachi as a lively city of secularly motivated Muslims climbing up the lower rungs of the capitalist ladder. Progress among young men is tracked by moving from a bike to a motorbike to a first car. Struggling upward comes through advancing into a professional job or moving into the underworld economy of repossessed and stolen cars. Other characters exist on the fringes of this young, entrepreneurial Karachi. Tanweer shows his readers an eccentric old communist and a few repressed older women repressing younger women. And, in tiny snippets, there are glimpses of the strictest Muslims, a minority in cosmopolitan Karachi. The short story chapters of The Scatter Here Is Too Great interweave and inform each other. The narrator’s hell-raiser childhood friend, Sadeq, for example, is the centerpiece of one story, but is discussed in others; the same can be said about narrator’s parents and sometime girlfriend, Sapna. But Tanweer saves shell-shocked Akbar, the ambulance-driver brother of the narrator, for the end of the book. The Scatter Here Is Too Great bears some similarities to Ben Lerner’s highly regarded Leaving Atocha Station, a novel built around a terrible bombing at the main train station in Madrid a decade ago. Both books focus on the lives of ordinary people before and after a terrible terrorist event in their city. Equally important, both feature an educated, self-indulgent narrator. But Lerner’s book, a sequential novel, is an easier read. The cross-referencing across stories required to fully follow Tanweer’s narrative is sometimes difficult. The Scatter Here Is Too Great is a book about complicated topics presented via complicated narrative. Tanweer is not fully successful in all of his endeavors, but his ambition merits him the benefit of the doubt. 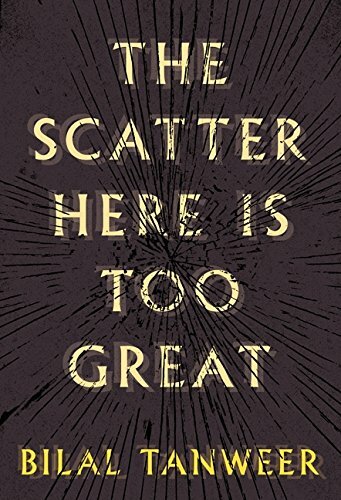 Though it will not be for everyone, The Scatter Here Is Too Great is recommended to readers looking for a thoughtful and original book on a serious set of topics.